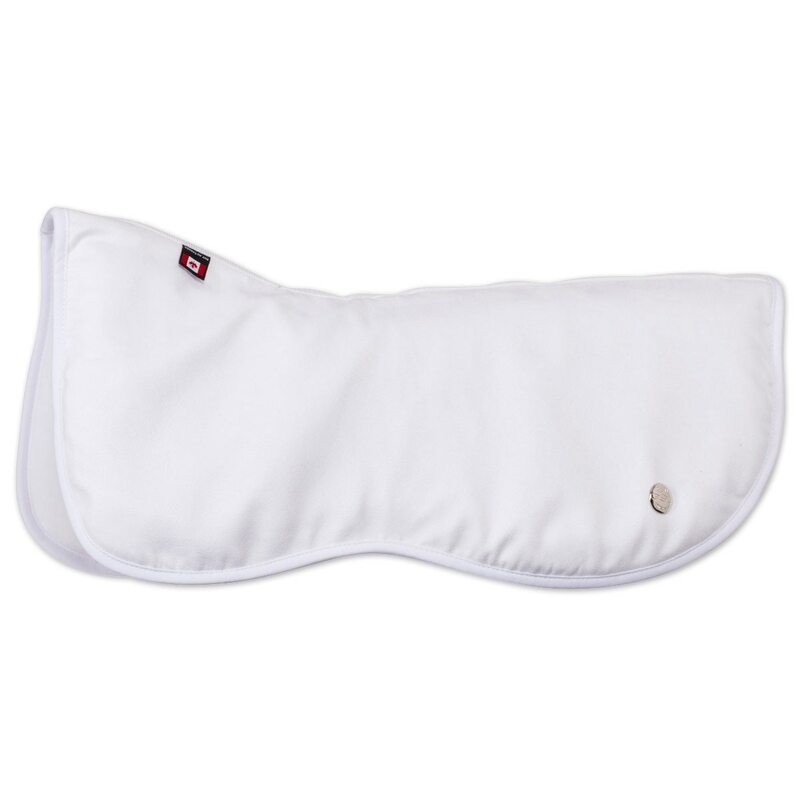 The Ogilvy Dressage Memory Foam Half Pad is the best solution on the market to avoid any back rubbing or friction. The memory foam acts as a buffer that fills any voids between the saddle and the horse, stabilizing the saddle and providing shock absorption for both horse and rider. This allows your saddle to fit perfectly on any horse, as the memory foam gets very thin where there are pressure points or where the saddle gets closer to the horse. As good for the rider's back as for your horse's back! 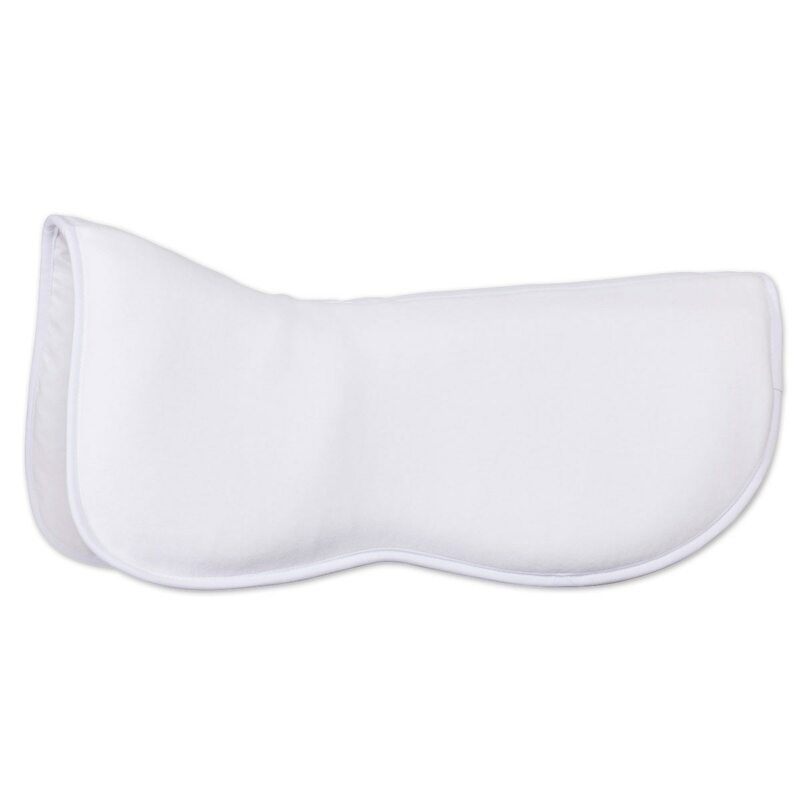 Ogilvy Dressage Memory Foam Half Pad is rated 4.3 out of 5 by 16. Rated 4 out of 5 by sher from comfy i liked the pad in the fact it really made it more comfortable, for me anyway i hope from him as well but i found even after my saddle was tight it made it feel like there was motion side to side. i guess i wish it had that same comfort in a thinner pad. Rated 4 out of 5 by Karen5400 from Nice pad but has downfalls I bought this pad a few weeks ago to help with cushion me and my horse. It's heavier and thicker than I expected but I like it better than sheepskin or other products. I did have to put no slip pad between this and my saddle pad since it was sliding behind my saddle - not very 'sticky'. Since it's new to us I'll do a follow up on a month or so. Rated 3 out of 5 by equestrian from Too Thick, however helped back sores quickly I bought a white one a month ago because my horses back was sore and it was helping! But when you wash it on low and cold it comes out with the insides all messed up to the pad is uneven. And it is extremely hard getting is back to normal. 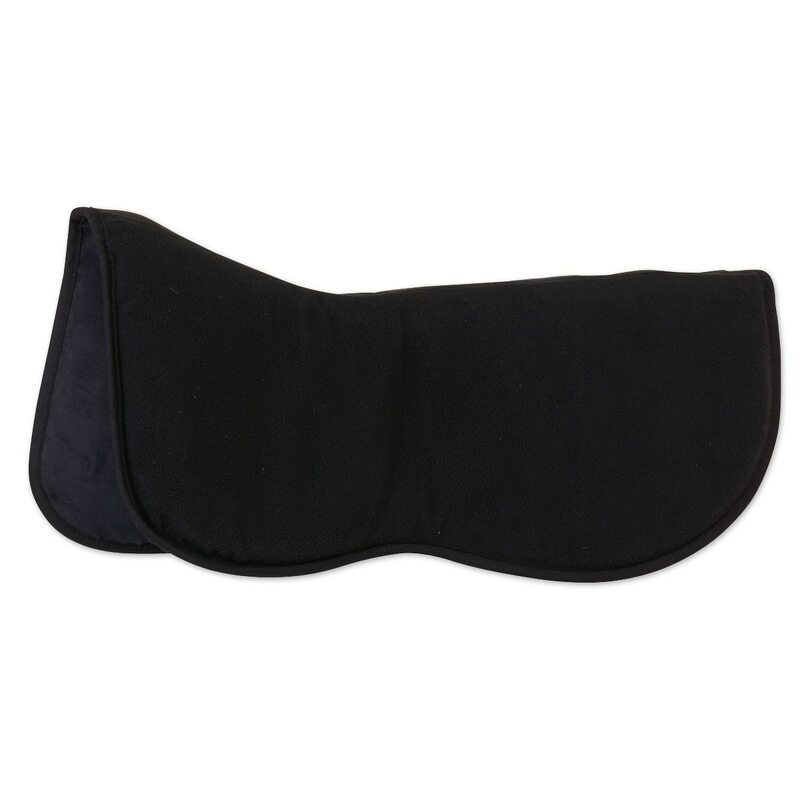 Without the awful washing problem this half pad can really help support and comfort a horse's back. Rated 5 out of 5 by Elizabeth from Love, love, love! I had a tough time fitting a saddle for my young horse and needed something to allow me to ride in the meantime. This pad for the bill! I love that you can wash it!! Rated 5 out of 5 by Dave from More comfortable My horse seems to be noticeably more comfortable with this half pad, my saddle because of my arabians rounded back would to shift at the rear. 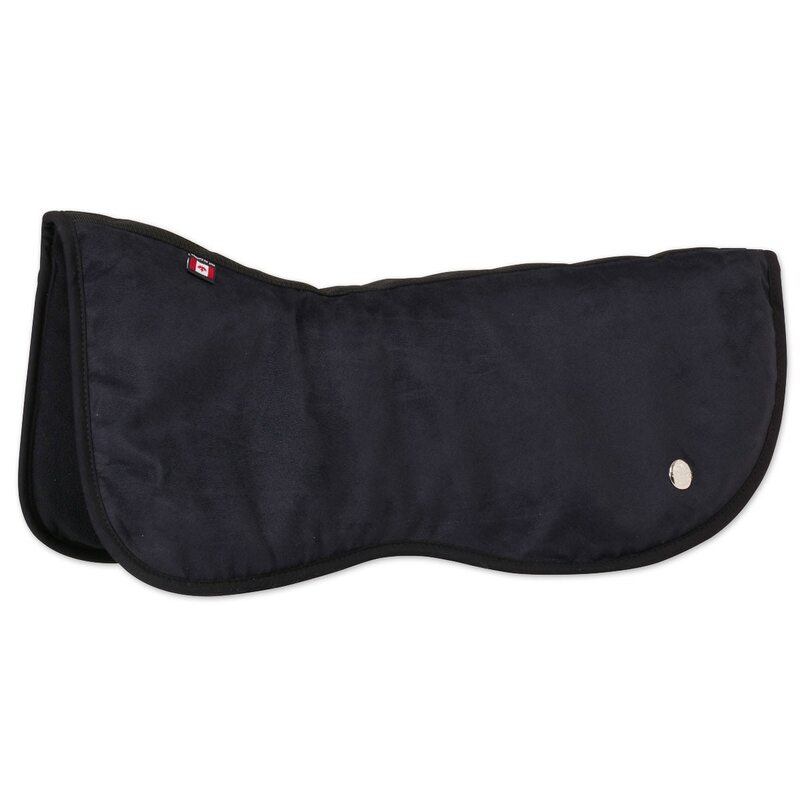 This half pad helps hold in in place and provides a lot of cushion when combined with a thicker saddle pad. Rated 5 out of 5 by erinchristine from Absolutely the BEST! I hemmed and hawed about this pad for months before taking the plunge and purchasing one. The price was probably the biggest reason I held off for so long, but this pad is beyond worth its weight in gold, especially as the cover is antimicrobial and washable. Recently I noticed that my saddle wasn't fitting my gelding the way it used to and my other half-pads weren't helping with any fit/uneven pressure issues. As I can't afford a new saddle, I decided to finally try Ogilvy. It was a miracle!! First time I used this pad was at a dressage show and I was amazed at how happy my gelding was and that when I unsaddled him the sweat marks were even on both sides, something I'd not seen in quite a while. I am so happy that I took the plunge and ordered this wonderful (and absolutely beautiful) half-pad! Rated 5 out of 5 by Lady in Waiting from Surprised at how much I like it! I usually am not a fan of half pads, but tried a friends Ogilvy on my new, thin Ottb. I was surprised at how much better my horse moved and how much better my back felt when riding in it. This pad forms right to the horse and aids in saddle fit. My only piece of advice is make sure that girth is tight, the memory foam sinks down once you are on your horse. And, it is a really pretty pad. I get a lot of compliments on it. Rated 5 out of 5 by Skygrey from Amazing Pad, worth the price I read reviews that people who bought this pad loved it, so I tried one too, and whole-heartedly agree! It fits different horses perfectly. My "tricky to fit" horse has a happier back and has had better gaits since I purchased this Ogilvy pad. It's a very good buy! Rated 1 out of 5 by 2inthedust from A whole lotta nothin' This seems like a great pad til you put a saddle on it and it squishes down to nothing. It provides no cushioning or support. Very disappointing.